Tonight I just threw together Quick & Spicy Stir-Fried Chicken with Broccoli. The part that was different about this stir-fry for me is that tonight I used boneless, skinless chicken thighs instead of the boneless chicken breasts that I normally use. I originally planned to grill the thighs outside after I got home -- but seeing that the temperature gauge on my car was already registering only 45 degrees at 5:00 and it was really windy too...I decided that cooking them inside instead would suit me just fine! I really didn't follow any recipe, but just put it together as I went (my favorite kind of meal to do)! I diced about 1-1/2 pounds of boneless chicken thighs and set them aside. Next, I thinly sliced a couple of green onions; julienne cut 1 carrot into thin strips; and minced 2 cloves of garlic. I also cut up about 3 cups of fresh broccoli florets and steamed them in a little water in the microwave for 3 minutes until they were crisp tender and still bright green. I quickly stir-fried the chicken in a hot wok in a couple tablespoons of extra virgin coconut oil until it was done; then tossed in the minced garlic, stir-frying for another couple of minutes; and then added the carrots and green onions. To make the sauce, I added a little over 1/2 cup of chicken broth to the wok; added a few tablespoons of low sodium Tamari sauce, a few good shakes of cayenne pepper a pinch of red pepper flakes and 1 teaspoon of hot Sriracha and stirred everything together. I then pushed the chicken and vegetables towards the outer edge of the wok, making a well in the center and added about 3 tablespoons of peanut butter to melt into the spicy broth mixture. As soon as it began to bubble a little, I stirred everything together to coat with the sauce. If you want a thicker sauce, add additional peanut butter; if you prefer a thinner sauce, add additional chicken broth a little at a time. Taste sauce for seasoning and make adjustments according to your taste. 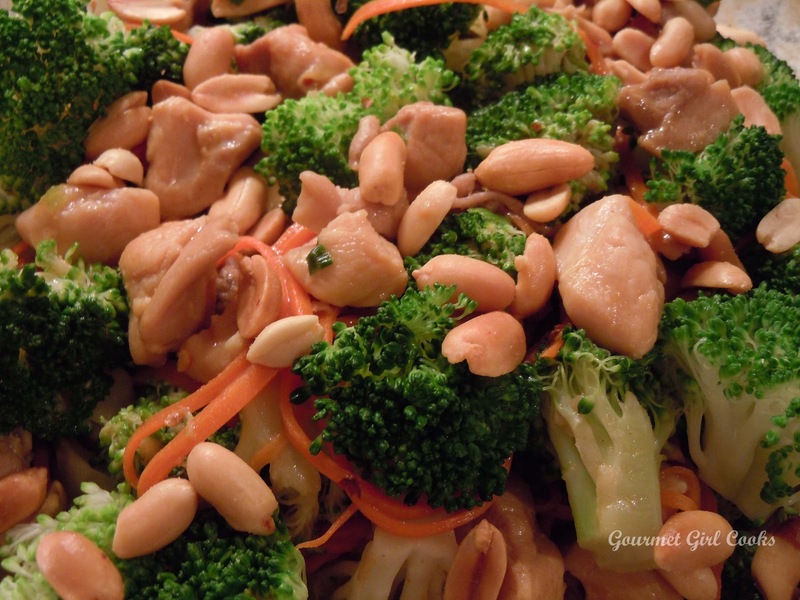 I sprinkled some roasted peanuts on top to add some nutty crunchiness that I love. I have to say, that I really enjoyed the flavor of the chicken thigh meat in this stir-fry. The meat was exceptionally tender and flavorful, and since I cut it up myself, it was trimmed well. I think the reason why I never liked getting dark meat at Chinese restaurants was that it was never trimmed well and was always blubbery and grisly, so I always paid extra to have them substitute white meat for me instead. The only time consuming part of the entire meal was cutting up the chicken and veggies which took about 20 minutes total. That, along with the 10 minutes or so of cooking time, and dinner was ready in about 30 minutes. I snapped a couple photos for you to see below. Enjoy! 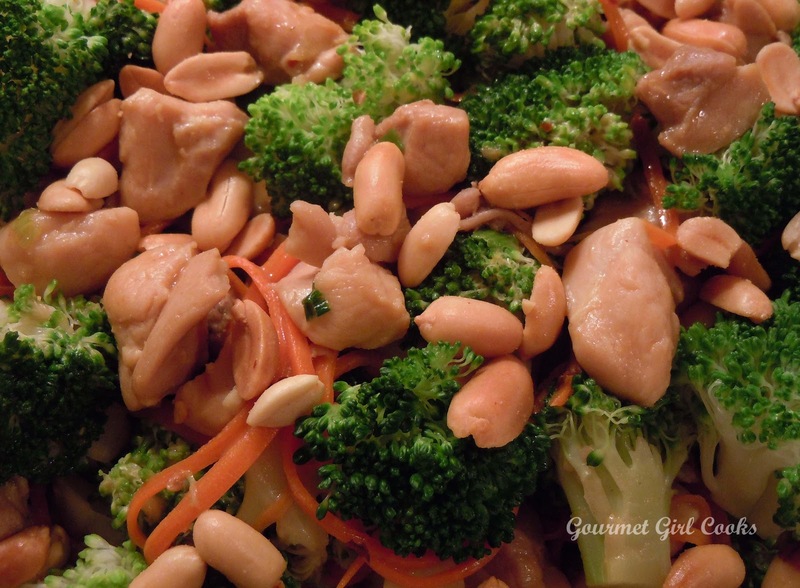 I have made stir-fried chicken and broccoli dishes zillions of times over the years but adding peanut butter never occurred to me. I made it last night and it was DELICIOUS!! The only change I made was to cut back on the spice for my portion but my husband added red pepper flakes to his and it worked. I really appreciate when a dish can be seasoned at different levels of spice and still taste great!